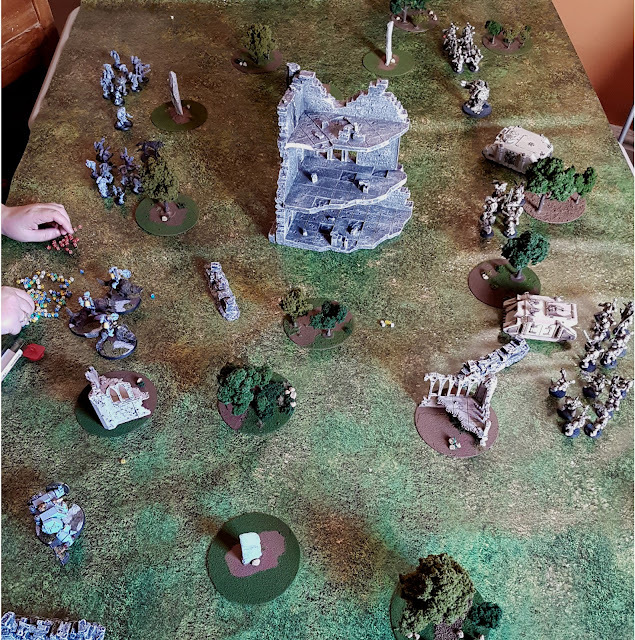 After our last game of 6th Ed Warhammer 40k my opponent (and younger sister) Sarah and I decided that it was time to upgrade. We had been reading more and more articles about 8th Ed Warhamer 40k online, and I was starting to see more and more memes about 8th edition that I simply didn't understand. At JADE we never have a problem playing older editions, but we do like to know what is going on right now in the gaming world, and both Sarah and I felt like 8th edition was changing the game and we were out of the loop. So we bought our 8th Ed Rulebook, and I picked up the Death guard and Chaos Space Codices. 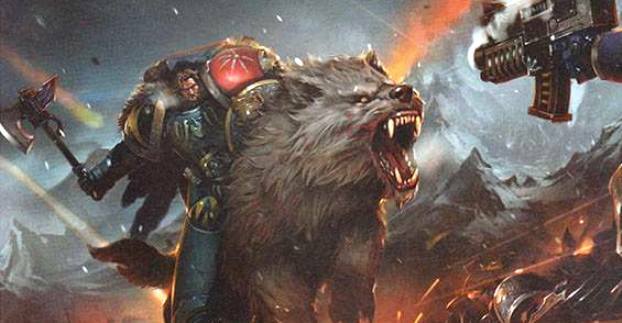 Sadly the Space Wolf Codex has not been released so we got Sarah the Index Imperium 1. 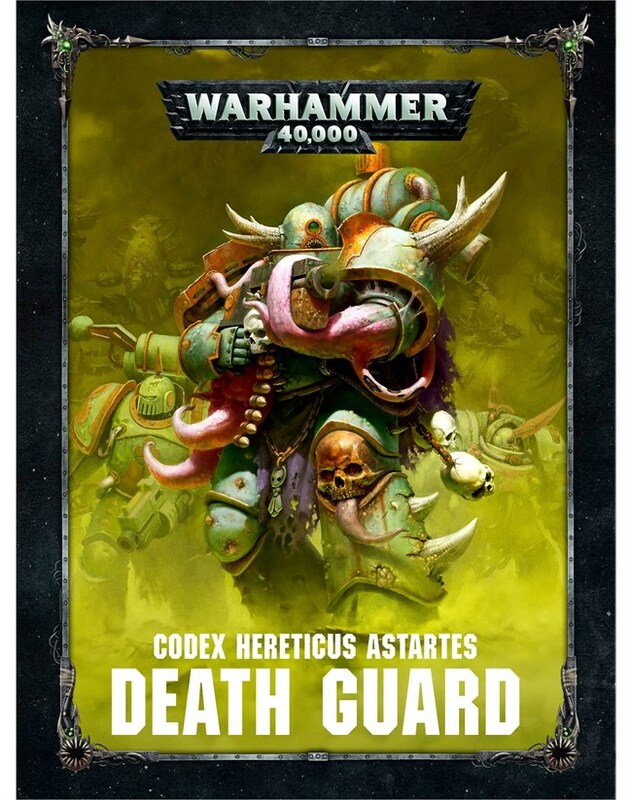 For me, it is still a little weird to think of myself as a Death Guard Player rather than a Chaos Space Marine Player running Plague Marines. 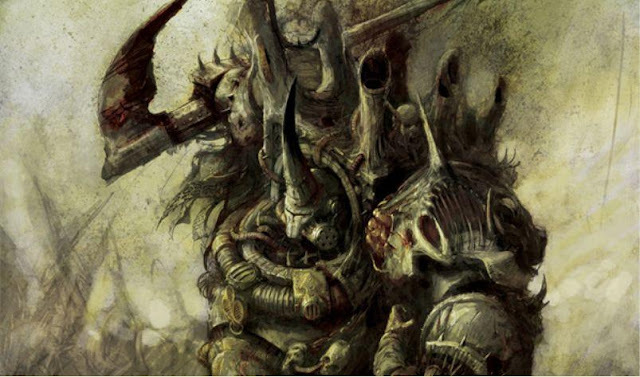 Since 3rd edition I always thought of myself as a Plague Marine Player not a Death Guard player but those are the new rules, and while I can still run Plague Marines in a regular Chaos army, they are an elites choice, where as in the Death guard Codex they are a troops choice. After our books arrived we began studying all the changes in 8th edition and preparing our forces. For our first match we decided to keep it as simple as possible. We would play an Open Play Annihilation Match using power levels. We would play on the horizontal edge of the table to ensure immediate contact between the two forces. And finally, Sarah would field the same army she had before, and I (having to rethink my force using a new codex) would build a Death Guard Army to counter it. 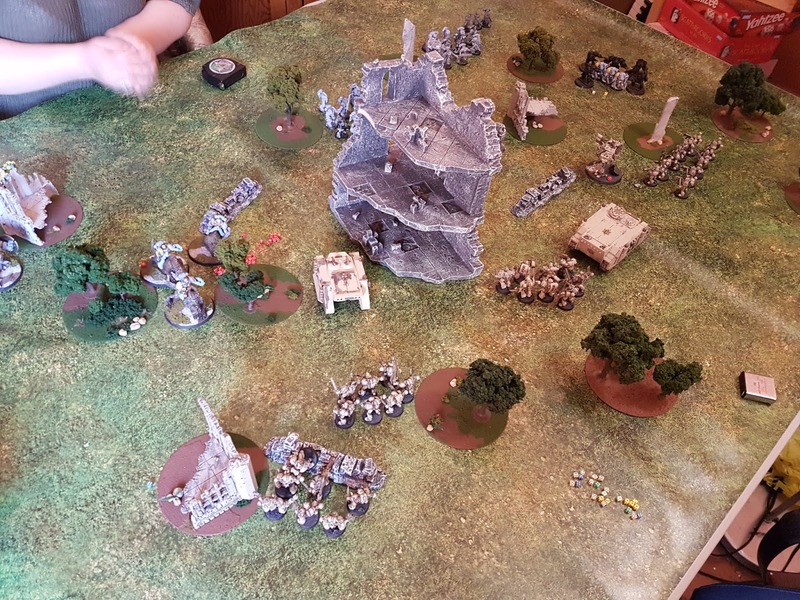 Like our last two games we use our only painted forces: Sarah's Space Wolves and my Death Guard. For this match we agreed we would give the power level system a try. We had both read online that power levels are considered quite broken and really not playable, but we wanted to see for ourselves whether this was the case. So Sarah was using largely the same force that she fielded last time, with only a few minor tweaks to make things "legal" in the new edition. Again we used every model that Sarah had available, though this configuration is largely based off of her previous force. The main difference between this and the force from Game 2 is the larger squad of Terminators. In 6th ed you could field a squad as small as three models. In 8th ed the minimum is five; so we had to turn the turn squads of five and three into one squad of eight. This massively bumped up the Power Level of this squad, so to compensate (and since this was an open play match) Sarah and I agreed that the eight-man terminator squad could take three Assault Cannon's rather than the usual one allowed by squad limits. It just seemed a little more fair. My army changed quite drastically from last game. This time around I fielded Typhus and I was fielding far more plague marines than last time. 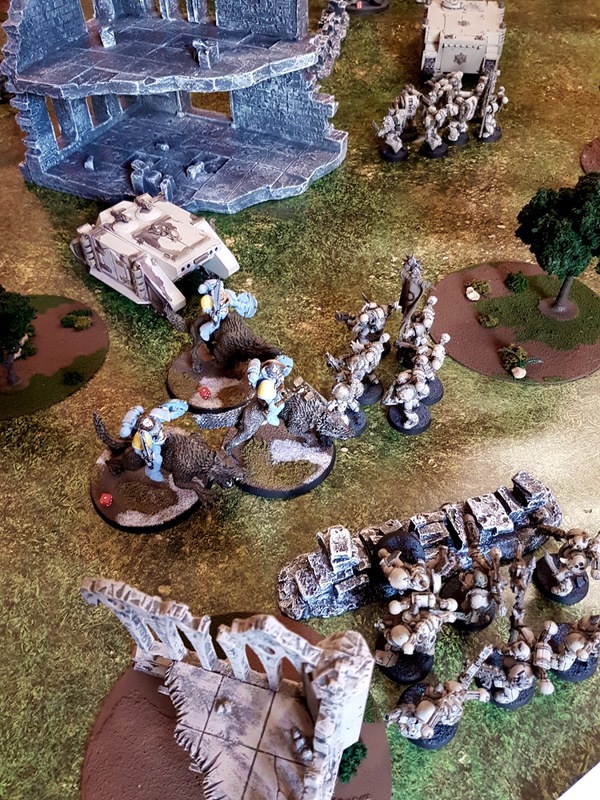 Since Chaos Havocs are no longer a unit choice available to Death Guard Armies I replaced those with Terminators - also remembering how devastating Sarah's were last game. For the sake of experimentation, I also made sure to include a slew of the special Death Guard Weapons among the troops. It has been a long time since Plague Marines have had an upgrade and I was really looking forward to fielding this force. For our past two games we had been fighting among dense overgrown ruins, using as many of the Urban Matz Ruined Gothic Buildings as we could. 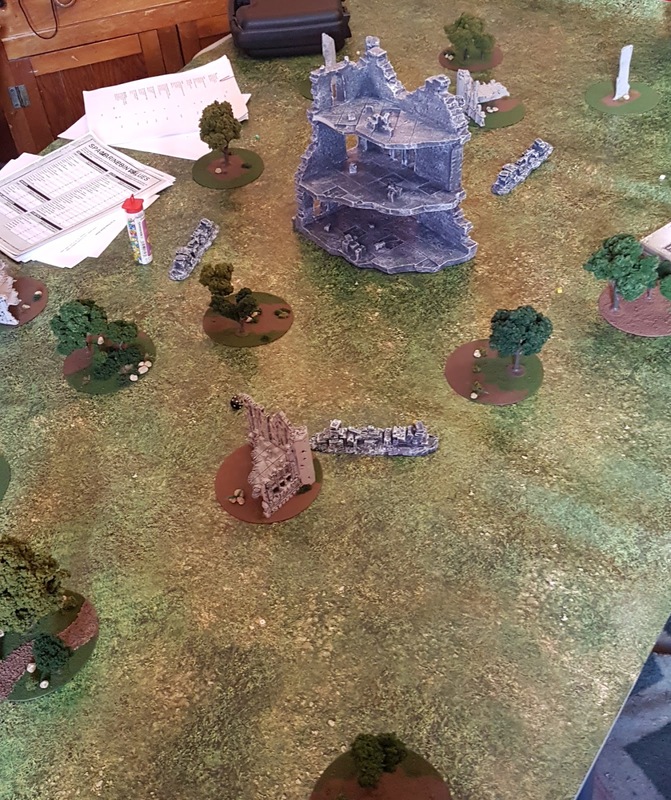 This time around our we decided to focus more on the homemade CD Scatter Terrain. I had recently created three Standing Stones and three old Games Workshop Gothic Ruins bases which gave use plenty to work with. The final touch was a single large ruin in the center of the field that gave the area a focus and the impression that we were fighting on the outskirts of an ancient and long forgotten town. For our first foray into 8th Ed Sarah and I decided to keep it simple and play an Annihilation match. Gone are Victory Points in Open Play, replaced by simply counting the remaining models on the table at the end of five rounds. In an Annihilation match the player with the most models remaining wins. We also decided to set up on the length of the table rather than the width, meaning that there was only 2 feet between us on our 6ft x 4ft table. We wanted the battle to get going as soon as possible, but still have enough space to maneuver. And with the battlefield set we were ready to begin. With my army deployed on the North side of the table and Sarah's on the South, we both set up our lines from East to West; heavily fortifying the Western side and leaving smaller forces to handle the East. The turn opened up with a few pot shots dealing only minor damage to either side and Sarah, In an attempt to crush my Western Line, also Teleport Striked her Terminators as close to my Dreadnought and furthest western flank. So right away we got to see some major differences between 6th and 8th. The new "Deepstrike" rules mean you get to chose when these units come in making them far more useful to deploy from a tactical perspective. After the Teleport Strike, on the Eastern side of the table Sarah's Thunderwolves miraculously rolled an 11" charge putting them into melee with my closest Plague Marine unit. The Thunderwolves are deadly, but my Disgustingly Resilient rolls on Plague Marines (allowing them to ignore an unsaved wound) were on fire after the 16 total attacks that her three Thunder Wolves get in 8th ed, only one managed to cause a single wound. 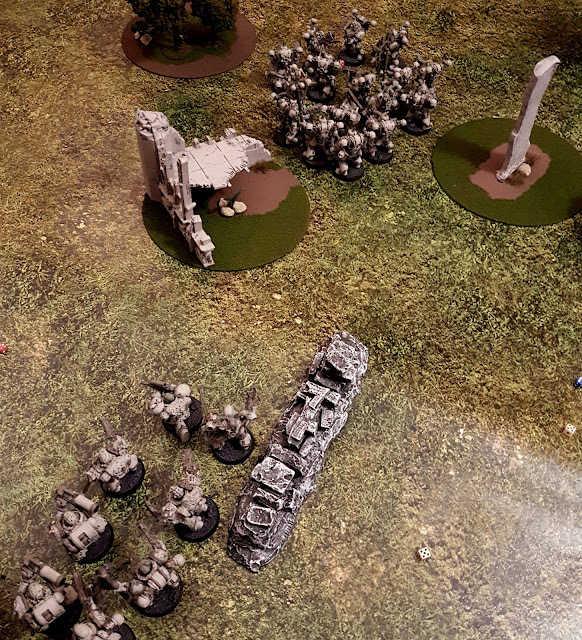 On my second turn I Teleport Striked my five Terminators and Typhus in behind Sarah's Western Flank, and laid on the fire from two Plague Marine squads in front. I ripped through her Long Fangs, and Massacred her seven man Grey Hunter squad. I also released my Posssed Marines from their Rhino on the Eastern front charging Sarah's Thunderwolves. By the end of my turn she had lost a full third of her army. During Sarah's go her Terminators were able to take out my Dreadnought once and for all. But she had simply lost too many units and they were too far apart to help each other. Needing support, she decided to drop her final Squad of Grey Hunters and Teleport Strike Njal onto the field. Feeling that the Western front was lost, she decided to wipe out my Eastern flank, and barraged my Plague Marines with a plethora of psychic abilities and bolter pistol fire. But it simply wasn't enough, my forces held and the melee continued. At this point, Sarah was feeling pretty disheartened. Her army was getting crushed while she had only removed a handful of troops from the field. However there was something else going on. Since the end of turn one we had both realized that something was wrong. My army looked a lot larger and more powerful then Sarah's was. In fact the entire time I was saying that I thought my army would be at least 500 points larger then hers if we crunched the points. So with it getting late we agreed this would be the last turn, and we would sit down afterwards and figure out what wrong with these two forces. This turn was pretty disastrous for Sarah. I destroyed her terminators on her Western flank and reduced the remaining 10 man Grey Hunter Squad on the West to 3 models. On the Eastern front Sarah's gamble to capture it would pay off in a turn or to, but it was honestly too late. 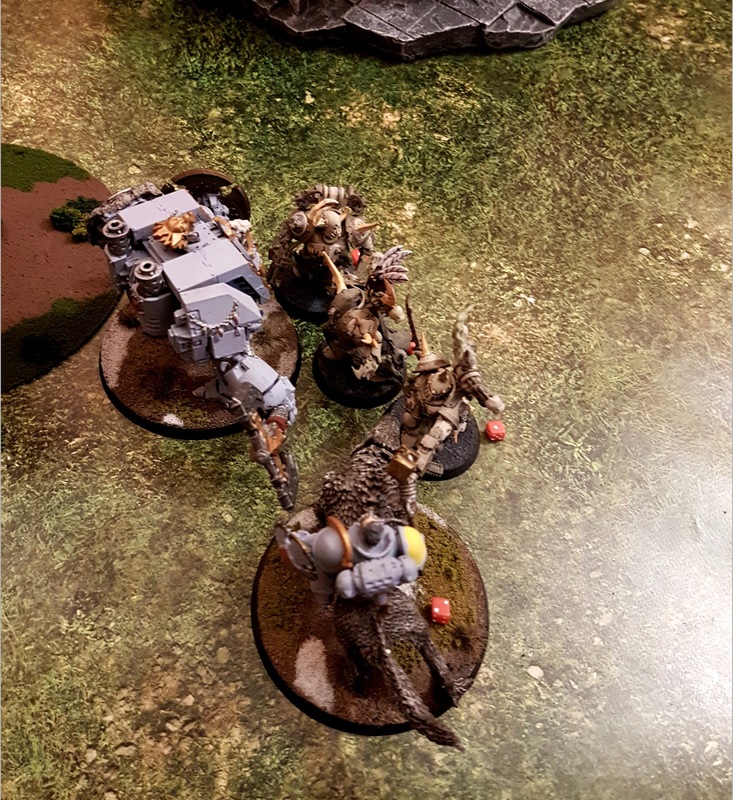 We ended the turn with her force more than 24" away from mine and with my rhino's still running she would have a hard time catching me. I could easily play keep away from the next two turns. So we called it there. In the end I won the game with 34 models remaining to her 19. To explain why I had had such a crushing victory, Sarah and I sat down and looked at the points values for the forces, rather than the power levels. It turned out that the army I used was around 1900pts. Sarah's on the other hand was closer to 1450pts. So I was pretty close in my approximation that we were off by 500 points, however it was in fact closer to 450pts. This was a huge disparity, and honestly proved to us that what the internet was saying was right: power levels are unbalanced, and practically unusable. With all that being said, Sarah did have some interesting comments about Open Play and power levels. She commented that despite the difference in forces, it was actually a very enjoyable battle. We both liked the new rule set, and as Sarah pointed out further, if we had played the same game with such a points disparity in 6th Edition she would have been quickly wiped off the map in a fairly boring game. So in defense of power levels, they actually managed to make an unbalanced game quite fun, and the lighthearted nature of setting up your army in an Open Game meant you could make a fun and flexible force you couldn't normally field. I would actually use power levels to introduce new players to the game, though I would also play closer attention the balance between each force. It made understanding the units and their different weapon and components a little easier, without getting bogged down in the numbers. For Sarah and I, we are a little beyond power levels. We both agreed that it was an interesting and worth while experiment, but we will be switching to points for our next match. This game was simply too unbalanced. 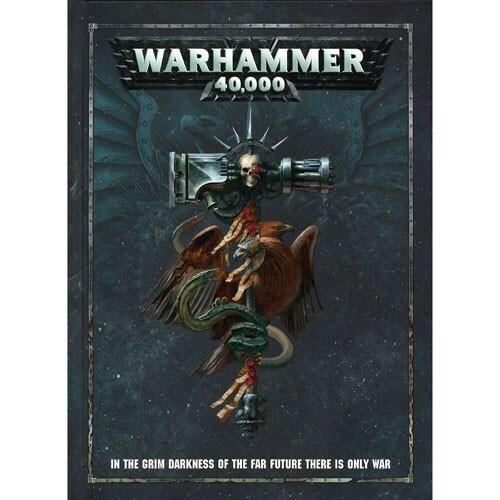 For those who have still not upgraded to 8th edition: there are a lot of changes, but it is fun and still feels like Warhmmer 40k.